The knife making courses at the Calnan & Anhoj forge includes forging, finishing and heat treatments of one layer blades. 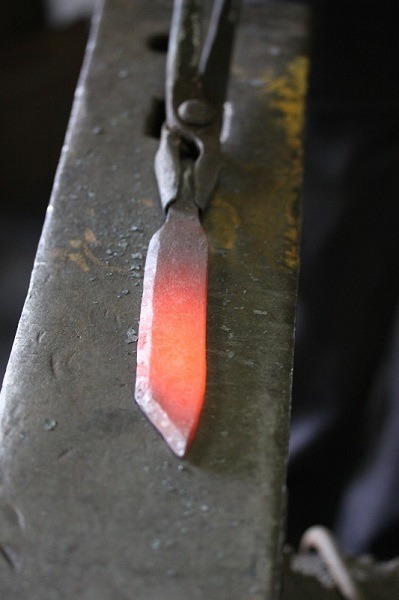 If you would like to make a good knife-blade of your own design, spend a day blacksmithing and get an insight into practical heat treatments, this is the course for you. 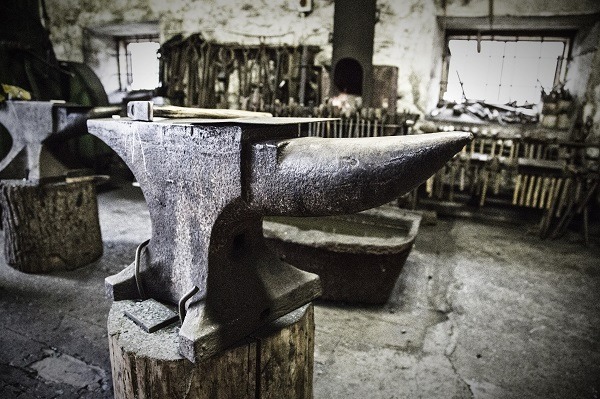 I am a blacksmith (not a blade smith) so you will learn the ‘blacksmiths approach’ to blade smithing, basic hardening and tempering skills will be covered – same as I would do the day to day hardening of tools in the hearth without the use of modern gadgets. Q: Can I bring my own design? A: Yes, prior to the course I will email a basic guide to blade shapes and uses. I recommend a blade length of 10-12cm (plus tang) as its a realistic size to finish nicely. Keep the blade length to a maximum of 15 cm (plus tang). Q: Will the course give me an idea of knife shapes, angles and different uses? A: Yes. Q: Will the course give me some history on knives? A: No. Q: Will the course cover heat treatments? A: Yes, I will go through the basic theory of heat treatments of carbon steels and then carry out the practical side of normalising and hardening. Tempering is done at home with the use of a kitchen oven. I call it ‘heat treatments for blacksmiths’, no gadgets, we use the coke-hearth. Q: Will we sharpen the blades during the course? A: Yes, participants usually manage to get this done. Again it takes time, so aim to get the edge started and assume you must do the final ‘razor edge’ at home. (The safest bet is ofcourse to do your final sharpen after the tempering and handle work is done) We have a couple of Lansky (diamond) kits, which will give you a choice of a 17-30 degree angle. Q: How long will the forging take? A: regular blades are usually done by 3pm. Iron age knives (also known as blacksmiths knives) with a forged handle will take you through more blacksmithing techniques – so gives you more time at the hearth – usually they are done by 4-5pm. Q: I want to make more knives at home, do I need to forge the blade? A: No. Just have a look at www.knives.com to realise the vast amount of process covered and see how minor a part the forging part plays in a modern knife forum. Q: I want to make a wood carving knife with a 20 degree bevel, can I do that on the course? A: Yes, but accurate bevels are based on stock removal (adding a jig to a belt sander or using a filing jig) We don’t have gadgets – so we will do a bit of maths, mark up and followingly work by eye. Q: Will I be doing all the work on my blade myself? A: Forging yes, but the use of power tools is reserved for the tutor only with the exemption of tradesmen or other people with experience of the use of angle grinders. Unless you want to keep a hammered blade finish, grinding tends to be the sensible option as a ‘100% hand made blade’ (as in filed) requires 2 days as opposed 1. Q: How do I fit in a hidden tang handle? A: Slow setting two-pack glue like araldite, or ask me how to use pine sap! Q: I want a blade with a guard and pommel, can I make that during the course? A: No, we don’t have time. Q: I want to make a ‘stick-tang’ blade, to fit layers of leather and other materials to the handle, can I make that during the course? A: Yes, but again that type relies on a guard and pommel (home work) Fixing a stick tang is traditionally done by riveting the end over, this can be hard to do with a carbon steel, so Id recommend a threaded version, easiest is to talk me into welding on a short section of threaded bar to the end of the tang.